For each and every journey on the rails, Amtrak Guest Rewards members earn points towards free trips in the near future. Amtrak; it’s America’s railroad and one of the finest ways to travel in the United States. With all drama arising in the airline industry, it is time to return to basics. It is the right time to focus on the many great reasons why Amtrak is the right choice of travel. There’s better leg room and there’s no need to put electronic devices on airplane mode. Further, it’s frustrating enough to be subjected to a never-ending wait at airport security checkpoints. With Amtrak, traveling is far more relaxing and more rewarding than ever before. Amtrak Guest Rewards is one of the top passenger loyalty programs in the travel industry. The rewards are not just earned on board. They can be earned anywhere and anytime. Amtrak Guest Rewards doesn’t just reward points for train travel and ticket purchases. Passengers accrue Amtrak Guest Rewards points for making everyday purchases with the Amtrak Guest Rewards Mastercard from Bank of America. With the Amtrak Guest Rewards Mastercard, passengers can earn points for purchases at well-known merchants. Presently, passengers can earn ten points per dollar when they purchase Intuit TurboTax. Passengers can earn ten points per dollar by shopping at eBags. Another popular merchant is See’s Candies. At See’s Candies, passengers can earn six points per dollar. The merchant with the largest rewards value is AnytimeCostumes.com. Passengers can earn thirteen points per dollar. Anytime Costumes has been in business since 1954 and online since 1997. The Amtrak Guest Rewards Mastercard makes preparing for the next trip on the rails all the more desirable. Once passengers have made their Intuit TurboTax purchase, shopped at EBags, or bought someone a gift at See’s Candies, they are earning instant Amtrak Guest Rewards points. 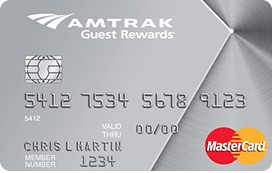 Using the Amtrak Guest Rewards Mastercard is that simple. 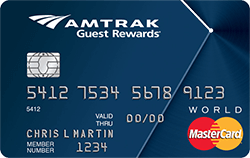 Amtrak Guest Rewards points for Amtrak travel or ticket purchases are posted to passengers’ accounts within three weeks. Points from all other purchases such as EBags and AnytimeCostumes.com will be posted within six weeks. The complete listing of Amtrak Guest Rewards merchant partners and point values can be found at www.AmtrakGuestRewards.com. Members who use the Amtrak Guest Rewards World Card can earn great perks including a complimentary Companion Coupon and a single-day pass for Club Acela or Metropolitan Lounge access. Bank of America offers two choices of Amtrak Guest Rewards Mastercard. There is the Amtrak Guest Rewards Platinum Card and the Amtrak Guest Rewards World Card. With the Platinum Card, passengers can earn twelve thousand instant points when they spent one thousand dollars or more in the first ninety days of activation. When using the World Card, passengers can earn twenty thousand instant points after having spent one thousand dollars or more within ninety days of activation. Passengers can view card details at www.AmtrakGuestRewards.com. Amtrak has without a doubt made traveling the most rewarding experience anyone could imagine. Earning points for traveling on Amtrak is the utmost fascinating. Earning Amtrak Guest Rewards points for such as tickets and cafe car purchases makes traveling even more exciting. Chiefly, earning Amtrak Guest Rewards points for shopping at popular online merchants makes riding the rails a well-deserved traveling experience. Amtrak Guest Rewards members are VIPs of Amtrak travel. Whichever card passengers use, the rewards and possibilities are endless. The Amtrak Guest Rewards Mastercard makes being a VIP and an avid shopper a combined traveling experience to savor for many journeys to come.